Are you constantly un-doing a mistake one of your Lotus Notes Domino users made? Here are two quick server settings and policy changes to help protect Notes users from themselves and relieve some administrator stress. Lotus Notes Domino users have a habit of unintentionally making an administrator's life miserable. This tip contains a couple quick Domino server settings and email policy changes you can make to protect users from themselves and lessen your day-to-day stress. When a user forwards email to an external address that has reached its quota, the external mail system sends that user a message informing him that he's over quota. Of course, every message that comes in is forwarded and replied to, causing a round-robin of messages that continues until the router hangs or the Domino server crashes because it's out of disk space. This issue is easy to prevent by disabling mail forwarding. 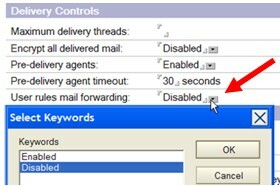 This setting can be found in the server configuration document under: Router/SMTP –> Restrictions and Controls –> Delivery Controls, which allows you to disable mail forwarding. Figure 1: Easily disable mail forwarding. Another problem occurs when a user wants to delegate access to their mail file, but instead actually changes the owner of their mail file. Crazy things start to happen, the most obvious of which is that sent email messages start to look as though they are from the delegate, rather then the user. The delegate then becomes the chair of every meeting that the user schedules. It's a tiny mistake that can cause serious headaches. You can avoid this issue altogether using a policy with a mail policy settings document. This option was introduced in Lotus Notes 7 and is available in Notes 8 as well (Figure 2). Figure 2: Clear the checkbox that allows users to change ownership. After you create this policy settings document, apply it to a policy document. You can apply it across the domain with an organizational policy or to specific people with an explicit policy. The button that lets users change ownership will disappear, leaving only an asterisk and a message stating: "Your administrator has locked some preferences," as shown in Figure 3. Figure 3: Leave a note for your users. Warning: From this point on, no one will be able to change ownership of the mail file. It won't matter if they have manager access or have full administrator access, the button will completely disappear. If you need to change ownership of a locked mail file, you must create a mail policy setting document by checking the "allow users to change ownership" box mentioned above. You'll also need to apply that setting to an exception policy and apply that policy to the locked user. Figure 4: Apply a setting to the exception policy. Using these methods will prevent help desk calls from users since they won't be able to make some of these obvious blunders. Please let others know how useful it is via the rating scale below. Do you have a useful Lotus Notes/Domino tip or code snippet to share? Submit it to our monthly tip contest and you could win a prize. Andy Pedisich is President of Technotics, Inc. He has been working with Lotus Notes and Domino since Release 2. Technotics provides strategic consulting, development and training on collaborative infrastructure projects for customers throughout the world. You can contact Technotics through their website at www.technotics.com and read Andy's blog at http://www.andypedisich.com.